Start your journey with the arrival at Zurich Airport where one of our representatives will receive you and help you to board a train to Lucerne, the gateway to Central Switzerland. It lies at the north end of the Lake Lucerne and has still preserved its medieval charm and elegant historic buildings. Upon arrival, check-into the pre-booked hotel and freshen up. Enjoy rest of the day at leisure activities and explore the city on your own. Visit some of its beautiful attractions like Chapel Bridge, Old Town, Swiss Transport Museum and enjoy a boat ride on Lake Lucerne. Return back to the hotel for dinner and overnight stay. In the morning post breakfast get ready to enjoy the most memorable experience of your life with an excursion to the glacier paradise of Mount Titlis. Start your journey with a train ride from Lucerne to Engelberg station which is about 35 km south of Lucerne. Mount Titlis is Central Switzerland’s biggest summer and winter ski resorts situated at the height of 3,239 meters where you can try snow tubing, visit the Glacier Cave, take a walk on the cliff, ride on a gondola and Ice Flyer chairlift to absorb the breathtaking views of Bernese Alps. Return back to the hotel for dinner and overnight stay. On the 3rd day of your Europe tour package from India, check out from the hotel and get transferred to the railway station to board a train to Interlaken the gateway to Top of Europe. Interlaken lies in the Bernese Oberland between the Lake Thun and Lake Brienz is one of the premier holiday destinations and is the starting point of numerous activities. Upon arrival, check into the pre-booked hotel and enjoy rest of the day at relaxing activities, exploring local markets, shopping etc. with dinner and overnight stay at the hotel. Post breakfast depart for an excursion to Jungfraujoch. This memorable train trip from Interlaken takes you to the charming village of Grindelwald from where you have to board a cogwheel train to ascend to Europe’s highest railway station. From the Sphinx Observation Terrace enjoy the mesmerizing and scenic views of the Alps and Aletsch Glacier. Also, visit the Ice Palace to view the beautiful sculptures made of Ice. Return back to the hotel for dinner and overnight stay after enjoying this exhilarating experience. After relishing breakfast check out from the hotel and proceed towards Railway station to board a train to Venice via Brig. Venice of the city of canals is located in the northeast Italy’s Veneto Region is laced across 117 mini-islands which sit within the shallow waters of the Venetian Lagoon in the Adriatic Sea which is accessible only by boat. Upon arrival, check into the pre-booked hotel and freshen up. In the evening stroll around wonderful canals or float along the fascinating Grand Canal. Return back to the hotel for dinner and overnight stay. Post breakfast proceed for the half day sightseeing tour of Murano, Burano and Torcello the three most famous islands in the Venetian Lagoon by motorboat. The first stop is Murano which is renowned for its glass factories and glassware shops. It still boasts a thriving tradition dating back to 1291. Explore the island on foot and stop at a glass factory to watch a skilled artisan’s work of art. Then proceed towards Burano and admire the picturesque fishermen’s houses painted in bright pastel colors and enjoy the craft of making laces. Then the next stop is Torcello which was established between 5th and 6th centuries and was the earliest center of civilization in the Venetian Lagoon. Visit the Cathedral of Santa Maria Assunta, circular baptistery in the church of Santa Fosca etc. Return back to the hotel and enjoy rest of the day at leisure activities with dinner and overnight stay. After breakfast check out from the hotel and proceed towards railway station to board a train to Florence which is the capital of Italy’s Tuscany region and is renowned for its beautiful Renaissance style buildings, marvellous churches and opulent Palaces that make it so unique. Upon arrival, check into the pre-booked hotel and take some rest. Later on, explore some amazing attractions of the city which includes Florence Cathedral, Uffizi Gallery and Baptistery of St. John etc. Return back to the hotel for dinner and overnight stay. In the morning after breakfast proceed for an excursion to Pisa and Learning Tower which is truly a splendid experience for its visitors. Travel to Pisa and begin your guided tour to Piazza dei Miracoli and iconic exteriors of the Learning Tower. 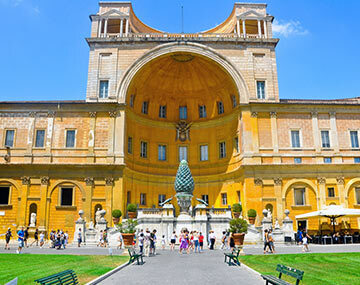 Enjoy a visit to Baptistery which is largest in Italy as well as Cathedral. Then visit the Scuola Normale, the university founded by Napolean in 1810. The guided tour will end by the magnificent Learning Tower climb to its top by mounting its 294 steps which is one-of-a-kind experience for its visitors. Return back to the hotel for dinner and overnight stay. On the 9th day of Central Europe tour check out from the hotel and proceed towards railway station to board a train to Rome, the capital of Italy. It is also known as the eternal city which leaves its visitors awe- stuck due to its rich cultural heritage, grandeur architecture and great beauty. Upon arrival, check into the pre-booked hotel and take some rest. Later on, enjoy exploring the majestically beautiful Rome and visit its amazing attractions which include the Colosseum and the Arch of Constantine, the Vatican City, the Pantheon etc. Return back to the hotel for dinner and overnight stay. After relishing breakfast proceed to explore Rome at your own pace on a hop on hop off open bus tour that takes you to several iconic attractions of the city. The double -decker bus with open top offers you 360 -degree panoramic views of the city along with a recorded commentary in 8 languages via headphones is also available at your disposal. Return back to the hotel for dinner and overnight stay. On the last of the most exciting and amazing Central Europe Tour check out from the hotel to get transferred to the airport to board a flight to the onward destination or back to India. This exhilarating and the exciting trip live with you as your precious memory that you cherish throughout your life. Central Europe is one of the Europe’s most beautiful regions to visit. With mountains covering so many states of the region it offers a great opportunity to the visitors to enjoy adventurous outdoor activities and explore the abundance of natural beauty. Millions of visitors come here to hike, walk, bike, skiing or just to ride the gondolas and funiculars to enjoy the majestic views of Alps. If you share the same passion then book your central Europe tour Packages now. If you are in search of a travel partner who looks after all your travel related needs then look no further. BookOtrip is your most trusted travel partner that helps you to enjoy hassle free holiday trip across the globe so that you can enjoy the best time with your family and loved ones.